We went to hear music tonight. The Muscle Shoals area is a magical place. Go into most any restaurant, bar, coffee house, or theater in the area during Handy Festival week and you'll hear musicians that you've heard all your life. Jilda did an update on her blog about coming so I won't bore you. 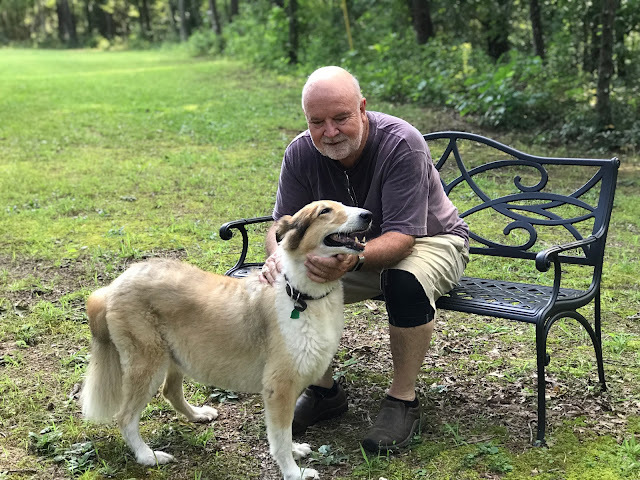 I did want to do an update on Cailou the wonder dog. If you recall, he got what the groomer called a summer cut back in May. I called it a scalping. His hair is finally coming back out. He should be back to his old self by fall. He's actually done much better with the heat this summer but I'm still not sure I'll get him scalped again. I hope your Saturday was a good one too. Hmmm. I'd think very carefully before coming to a final decision about shearing or not shearing Cailou next summer. It does reduce the heat stress on both cats & dogs with long heavy coats. And sheep too, just in case you acquire a sheep before next summer!! And why did you give your dog such a tricky name? I can never get the vowels in the right place. My Saturday was fine, we're up to Sunday now. Busy morning going off to buy a few essential household items. Spending this afternoon reading the instruction sheets & getting things working. Cailou looks so beautiful. Maybe you can ask Cailou if he wants a shave next summer. I know a hair cut always makes me feel good. Hair can keep the heat in . Maybe you can ask the groomer to not cut the hair so close to the skin next time... I'm sure they have some adjustment gadgets they can put on their clippers to cut the hair a little longer. Yes we will get him trimmed but not shaved. If we could start with his coat about the length it is now, I think he would be fine. He has done much better this summer. What a wonderful picture of you and your dog! He certainly looks happy enough and so do you ! All this heat hasn't changed your smile one bit. That short coat must also make burr removal and tick spotting easier...something we don't need to worry about in my parts of Jersey. I would worry about things like sunburn with his hair all gone. But I'm glad he dealt better with the heat. Cailou is beautiful, with or without hair!! Glad that he coped with the heat better. And echoing fishducky.